See in Glossary and Plastic SCM. Refer to those pages for specific information regarding your choice of version control. Using a version control system makes it easier for a user (or multiple users) to manage their code. It is a repository of files with monitored access. In the case of Unity, this is all the files associated with a Unity project. With version control, it is possible to follow every change to the source, along with information on who made the change, why they made it, and what they changed. 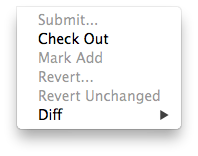 This makes it easy to revert back to an earlier version of the code, or to compare differences in versions. It also becomes easier to find out when a bug first occurred, and with what changes might have caused it. Set up or sync a workspace on your computer using your chosen client (refer to the Plastic SCM Integration guide or the Perforce Integration guide for help with this step). Copy an existing project into the workspace, or start Unity and create a new project in the workspace. See in Glossary, then select the Editor category. See in Glossary, choose your Mode according to the version control system that you chose. Fill out your version control settings, such as username / password / server / workspace. Keep Automatic add checked if you want your files to be automatically added to version control when they’re added to the project (or the folder on disk). Otherwise, you need to add new files manually. You have the option to work offline. This mode is only recommended if you know how to manually integrate changes back into your version control software (Working offline with Perforce). See in Glossary options to suit your team’s preferences and choice of version control. Click Connect and verify that “Connected” is displayed above the Connect button after a short while. Use your standard client (e.g. p4v) to make sure that all files in the Assets and ProjectSettings folders (including files ending with .meta) are added. N.B. At any point you can go to the Prefences menu and select External Tools and adjust your Revision Control Diff/Merge tool. * To get the latest changes and update the file using Plastic SCM, you need to use the version control window. ** Locking and Unlocking using Plastic SCM require you to edit a specific Plastic SCM lock file externally, see the Plastic SCM Integration page for more information. 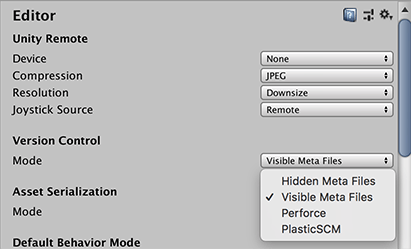 *** Conflicts are shown within the version control menu but resolved in the Plastic SCM GUI. 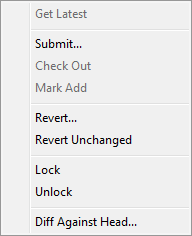 The ‘Outgoing’ tab lists all of the local changes that are pending a commit into version control whereas the ‘Incoming’ tab lists all of the changes that need to be pulled from version control. By right clicking assets or changelists in this window you perform operations on them. To move assets between changelists just drag the assets from one changelist to the header of the target changelist. Certain version controls will not allow you to edit assets until they’re marked as Checked out (unless you have Work offline checked). See in Glossary file it will automatically be checked out. See in Glossary have a checkout button in the bottom right that allow you to checkout settings. A yellow warning will often appear to remind you to check out items in order to make changes to them, this mostly applies to Project Settings inspectors. In Plastic SCM automatically generated assets such as light maps are automatically added/checked out. 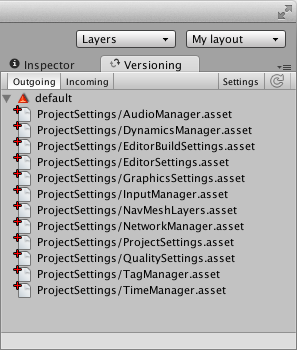 When working with assets, Unity automatically checks out both the asset file as well as the associated .meta file. In most situations however, the .meta file is not modified, which might cause some extra work e.g. when merging branches at a later point. Unity supports working in offline mode, e.g. to continue working without a network connection to your version control repository. Select Work offline from Version Control Settings if you want to be able to work disconnected from version control. Unity supports asynchronous version control status queries for some version control providers, such as Perforce. This option allows those providers to update the version control status of files without stalling Unity. Use this option when the connection to your version control server has high latency. If you experience stalls during status queries, go to Version Control Settings and select Allow Async Update. Note: Only status queries are asynchronous. Operations that change the state of files, or require up-to-date knowledge of file status, are performed synchronously. If Unity cannot commit your changes to your version control client, (for example, if the server is down or license issues occur), your changes are stored in a separate changeset. Documentation on asynchronous version control status queries added in Unity 2017.3.